2015 BBMP election, a vote for change or another round of musical chairs? BBMP has 198 wards, out of which elections were held for 197 wards. The data filed for 38 candidates is incomplete (missing contact details/family details etc.). As additional data is available this report will be update. you can always find the latest copy of this report at http://rpubs.com/vijayvithal/106792 This report looks at the profile of the candidates filed by the three mainstream parties and analyses the election on various factors. The following details are missing from the data set. In 2010 the Existing BMP was mearged with surrounding CMC’s, TMC’s, ZP’s and gram panchayat’s to form BBMP. This exercise resulted in consolidation of various units of local governance with over a thousand elected representatives into a single unit with 198 elected representatives. The wards delimitation’s was done based on the 2001 census which showed dense clusters in the core BMP area and sparse population in the outer wards. In the very next year it was evident that the wards are imbalanced, when the 2011 census showed that the outer wards had much higher population compared to the inner wards. It is estimated that the additional 25.26 Lakh citizens are predominantly added to the outer wards. Checking for voting percentage the voter turnout this time increased by 4.7514. Dividing this data into core (Inner Wards) and non-core(Outer Wards) wards we find that the turnout increase is more in the inner wards. While the absolute numbers indicate that there was very little anti-incumbency factor, evaluating ward wise data ward indicates a strong anti incumbency current. with the citizens changing the corporator irrespective of his/her party, It is not clear whether the citizens are satisfied with an alternate instead of an alternative. A total of 86 constituency changed their party. 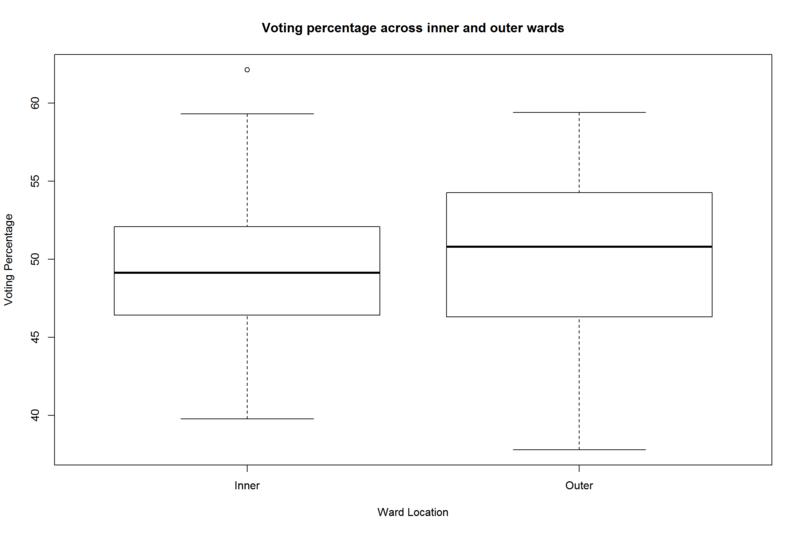 The voters in outer wards showed much greater participation compared to voters in Inner ward. 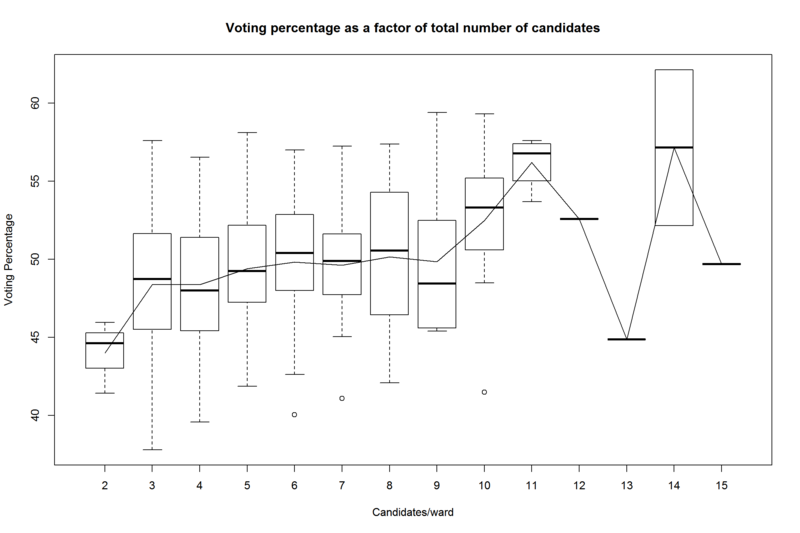 Voting percentage was higher when the choice of candidates was more. The impact of gender reservation is a sub case of diversity of choice, betweeen seats reserved for women vs gender neutral seats for the same caste reservation. the difference in voter turnout is negligible. Typically in areas with high migrant population, The actual voting percentage is different than the reported voting percentage. This is due to two factors. A significant percentage of people in the voters list have migrated out of the area, and their names are still in the voters list. A significant number of new migrants are still not in the voters list due to voter ignorance or lethargic babudom. The scenario in the next election. Breaking up BBMP in 5 municipal corporations. Provision for further population growth in outer wards during ward delimitation. The current approximate mean outer wards population (assuming growth rate in these wards is 18%) is 122 thousand in 2015. If the current wards are delimited in proportion to the population, then the ratio of outer to inner wards will be 2.2459 : 1. i.e. for existing 198 wards we will have 61 inner wards and 137 outer wards. The restructuring report speaks of factoring in the future increase in ward population during delimitation, this will result in distrubution of the proposed 400 wards across 102 inner wards and 298 outer wards. 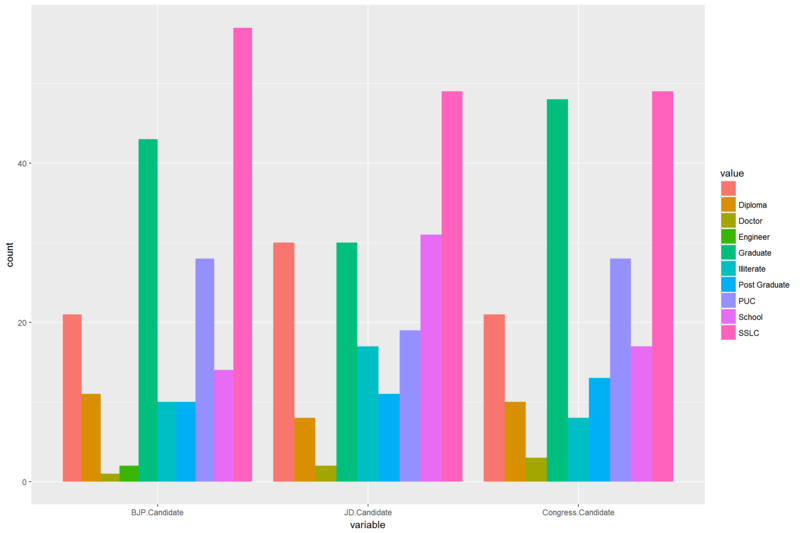 While there was a strong anti-incumbancy current, and as per some reports the winning margin for BJP was 1% or less indicating a closely fought elections, It is not clear what led to the vote swing in some seats and not in other. Projects was not an issue. Retaining wards and flipping wards had the same project spread. Project amount was not an issue. We saw the same statistics for both the retaining and flipping wards. Number of candidates was not an issue. In a few sample ward studies, the ward infrastructure quality was not an issue. A certain politician making veiled threats of “smooth” center-state relations and his opponent making similar threats of state-municipal relations raises the question of whether voting for a given party influences the ward development. 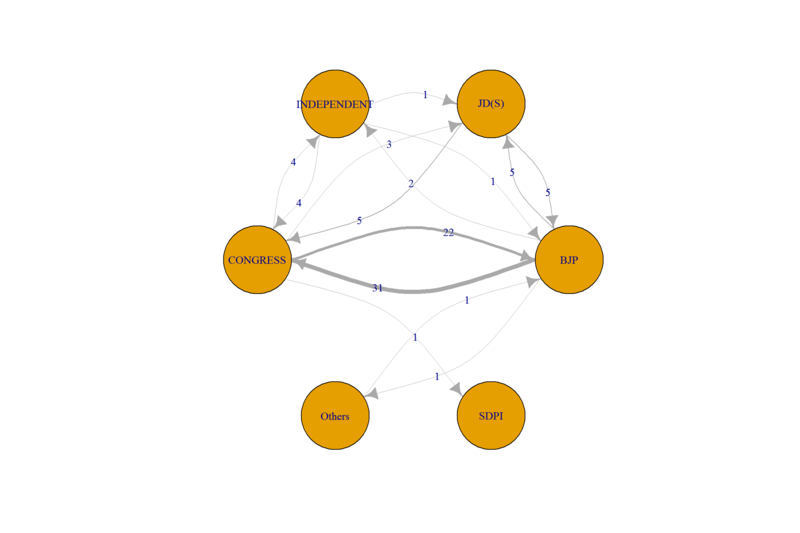 Analysing the budget tells us that the influence of party on project amount is minimal. 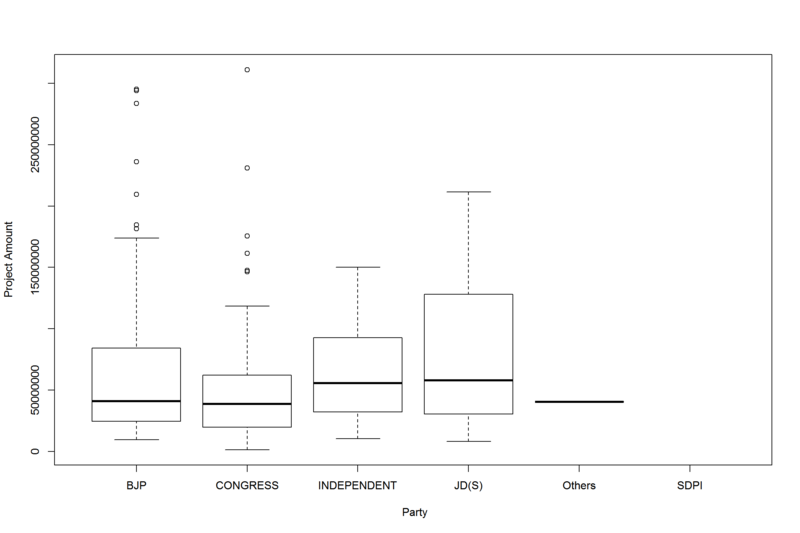 Contrary to expectations independents and JD-s recieved more than the first two positioned parties. Why did some independents win and others did not? Why did JD(S) which projects itself as a rural party make inroads in the city core?